The Hierarchy of Angels also known as the Angel Network, this Hierarchy within the Angelic Realm is mirrored throughout the rest of the universe. The Angel community is the perfect example of this hierarchal order and structure. 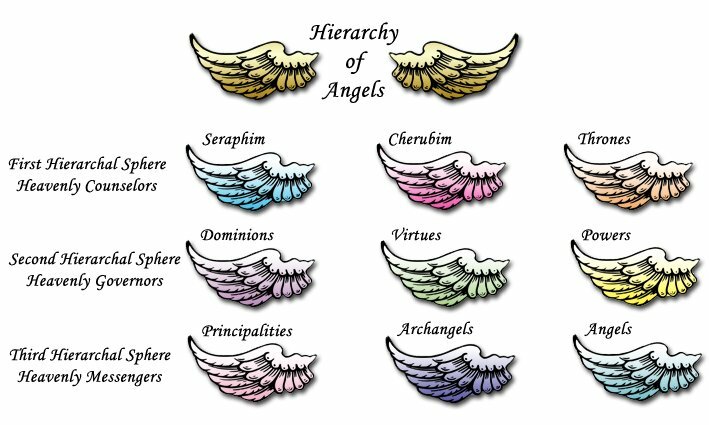 The nine orders or choirs of angels in the Hierarchy of Angels are divided into three hierarchies, each of which is divided into three orders: the highest, the intermediate and the lower. Each section of the community has its own purpose and energy. In the table below the left hierarchal organization of Angels are according to Pseudo-Dionysius the Areopagite in the Fourth or Fifth century, in his book "The Celestial Hierarchy" and is considered the standard in the Western World. In the right table is the Hierarchal organization of Angels from the comparative study of the Old Testament and New Testament passages, including their etymology (history of the words) and semantics, several theological works (which contain variations) and esoteric Christian teachings. Personally I like to add the Elemental Kingdom to the Angel Network just below the angels and don't forget your own personal helper from the Angelic Kingdom... your Guardian Angel! According to Jewish Encyclopedia, "Angelology", Maimonides, in his "Yad ha-Chazakah: Yesodei ha-Torah", states there are ten hierarchal ranks of Angels in the Jewish Angelic Hierarchy, and as above the Angel Network following begins at the highest rank. 8. Bene Elohim "Sons of Godly Beings"
The Tree of Life is one of the most familiar of the Sacred Geometry Symbols. 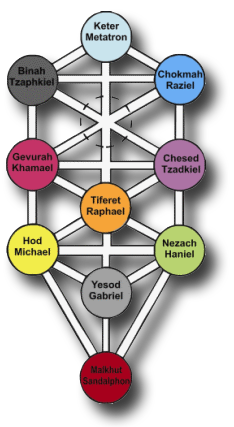 The structure of the Tree of Life is connected to the sacred teachings of the Jewish Kabala. The Tree of Life describes the descent of the divine into the manifest world, and methods by which the divine union may be attained in this life. It can be viewed as a map of the human psyche, and of the workings of creation, both manifest and not. There are ten Archangels, each commanding one of the choirs (orders) of angels and corresponding to one of the Sephirot as seen in the "Tree of Life" above. As you can see this hierarchal layout is very similar to the Jewish Angelic Hierarchy. Have you seen the Angel Cards? They are stunning to have in your sacred space and or to make into pictures for the wall in your healing room or any where else in your home, they also make the most incredible gift.